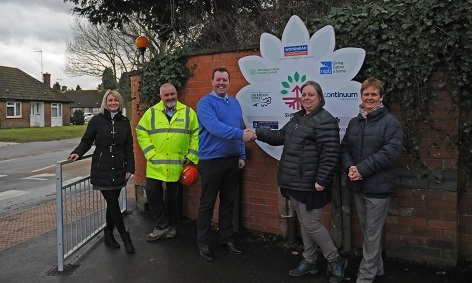 MP for Sherwood, Mark Spencer, has praised Construction Company, Robert Woodhead Ltd’s response to the Edwinstowe community when they showed concern over the safety of a pedestrian crossing in the North Nottinghamshire village. The crossing connects the car park for the Sherwood Forest Visitor Centre to the tourist attraction itself. Woodhead is currently responsible for the build of the fantastic new Sherwood Forest Visitor Centre, set to open in 2018. The centre will include information about the legendary tales of Robin Hood, and the local environment and wildlife. Nottinghamshire County Council is working together with the Royal Society for the Protection of Birds (RSPB), which heads a partnership to bring this state-of-the-art and impressive building to the local area, in the hope that it will help to inspire and entertain anyone who visits from nearby to further afield. Other partners include The Sherwood Forest Trust, Thoresby Estate, Continuum Attractions and the Woodland Trust. The new centre, based in Forest Corner just outside the village of Edwinstowe, will include a shop and café, with a terrace and amphitheatre outside. Plans feature the addition of a brand new play area with a Robin Hood theme. Woodhead installed the new pedestrian barrier to improve safety at the crossing.